We Were Woodwards: A Lutefisk Eating Contest - say it isn't so! A Lutefisk Eating Contest - say it isn't so! Check out this link - what is that beige drink they are slurping near Seattle - they think it is Lutefisk? 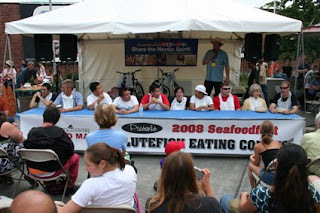 I just wanted to pass on this link about the Lutefisk Eating Contest at the Ballard, Seattle Seafood Festival. Seems that a brave fishing boat captain picked up his bowl and downed two pounds of lutefisk in seven seconds. This was acknowledged to be a new world record by people who care about lutefisk. Just goes to show that the Scandinavian traditions are alive and well in pockets of the country outside of Minnesota. Turns out Ballard, a suburb of Seattle and a hotspot of Norwegian civilization (the contest was held in Bergen Square), and congratulations to Einer Johannsen, the hardy winner of the lutefisk eating contest. I notice in the story that Mr. Johannsen "slurped" his lutefisk—drank it down "like Rainier beer," he said—which suggests that this was a liquefied lutefisk, or at least something less solid than what decent people would serve in Minnesota. And of course here in Minnesota we were brought up not to rush through a meal, and certainly not a meal of lutefisk. Food should be savored, not bolted. So this is not the great accomplishment it may seem to be. It is sort of like winning the Loudest Laugh contest. I also note that a sushi bar is opening in Ballard. For some older Norwegians, raw tuna represents a greater challenge than lutefisk, my Mom couldn't eat sushi, however she ate Herring often - despite the fact they were both raw.